Monday, 7th December, I will fly to Cambridge to attend the Semantic Web Applications and Tools for Life Sciences (SWAT4LS) conference and also visit colleagues at the new AstraZeneca site. 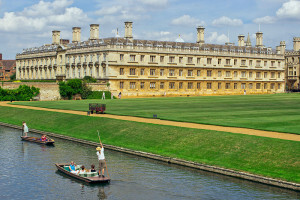 The conference programme looks interesting and the venue, Clare College, fantastic ("Harry-Potter-land" was my husband's comment when he saw the pictures :-). Will be great fun to meet friends and colleagues in the Semantic Web community.